Those police sirens are a particularly...festive touch. Even more interesting, though, is the question of how HuffPo blew it so badly. 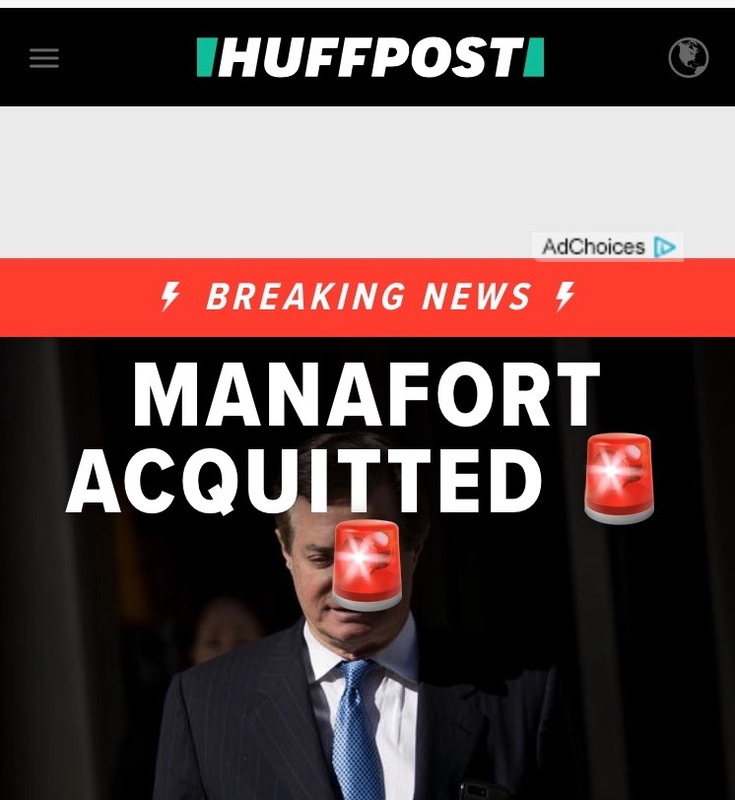 Manafort was most certainly not acquitted. In fact, he was convicted on 8 of the 18 counts against him, while the jury was hung on the other 10. This is, by any measure, a disaster for Manafort. The eight guilty verdicts included five tax fraud charges, one charge of hiding foreign bank accounts and two counts of bank fraud. Among the eight, the biggie was felony tax fraud, which carries a maximum sentence of 30 years. The other charges could add up to a maximum of 50 years, meaning Manafort is looking at the possibility of 80 years in the hoosegow based on Tuesday's verdicts. No first-time convict serves their full sentence, but even 10 years would be devastating for a fellow who is already 69 years old. And then, on top of that, Manafort's got his second trial next month, and he could well be retried on the 10 counts that were left unresolved Tuesday. He is, to use the formal legal term, screwed. So, what does Manafort do next? If he's going to flip, now is presumably the time. No matter how well the second trial goes (and there's every reason to think it will go as badly as the first), he is already looking at spending most or all of the rest of his life in prison. If he's going to sing like a canary in order to save himself, why not avoid the hassle and expense of a second (and possibly third) trial? Further, the more hoops that Team Mueller is forced to jump through, the less charitable they will be in their plea offerings. If Manafort does not flip in the next two or three weeks, then he's presumably all-in on a presidential pardon. Or he really is trying to keep Oleg Deripaska's secrets at all costs. At very nearly the same time that the Paul Manafort jury was announcing its verdict in Virginia, prosecutors in New York were in court asking Judge William H. Pauley to sign off on the plea deal that Michael Cohen has agreed to, which he did. By the terms of the agreement, Cohen pleaded guilty on eight counts, and (at the moment) is slated to spend between 3 and 5 years in jail, and to pay a hefty fine. One of the big elements of the Cohen news, repeated in just about every piece on the plea deal, is that he's "not cooperating" with the feds (either Robert Mueller or anyone else). At first glance, this seems like good news for Donald Trump, but it is not. This is a little bit tricky, so bear with us, but a more accurate way of describing things is that Cohen did not trade a guilty plea for his cooperation. In fact, he was so concerned about the costs of a trial, and the risk that his family would be left penniless, that he made a garden-variety plea deal of the sort that white-collar criminals make all the time: "I will spare you the necessity of prosecuting me in court if you give me a reduced penalty." In other words, it is not the case that Cohen refused to cooperate, or has been excused from cooperating. It is merely he hasn't reached agreement with the government on that point. And the odds are that, sometime soon, he will sing like a canary. 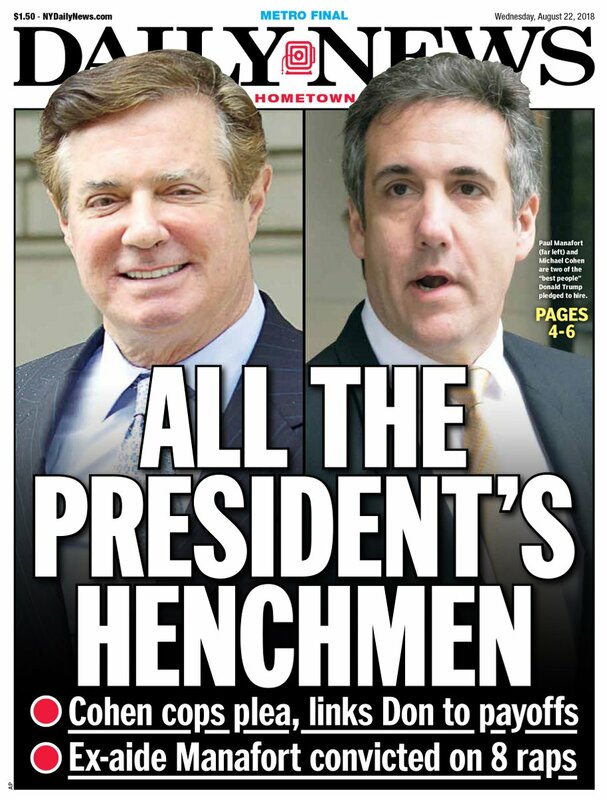 Just by copping a plea, in fact, Cohen has already cut Trump off at the knees. Not only because yet another Trump associate is now a felon, but because one of the crimes that the former fixer pleaded guilty to was breaking campaign finance laws at the President's direction. In other words, Cohen is already officially on the record throwing Trump under the bus. The plea itself is a form of cooperation with Mueller. Beyond that, however, is that Cohen still has a lot to lose, between the jail sentence and the fine. That means that Mueller has something to offer: "We'll shave some time/money off that sentence, Michael, if you tell us what else you know." And just in case there was any doubt that Cohen is open to such an offer, his lawyer Lanny Davis appeared on Rachel Maddow's program (and also talked to the Washington Post) and suggested that Cohen can verify that the President personally conspired with the Russians to hack the Democrats' e-mails. He also said that, "my client is more than happy to tell the special counsel all that he knows." Pretty much the only thing Davis didn't do was turn to the camera and mouth the words "Robert...call me." In a development that came as a rather big surprise, the Department of Justice indicted Rep. Duncan Hunter (R-CA) and his wife Margaret on Tuesday for illegally using campaign funds for personal expenses. This included big expenses (luxury vacations) and small ones (their kids' lunches at school). While it's true that Hunter and his wife are innocent until proven guilty, the feds' investigation of them lasted for over a year, the indictment contains 17 pages' worth of counts against them, and the conviction rate in federal courts is very, very high. So, the two should probably start shopping for paddles on amazon.com for their trip up the river. What does this have to do with Donald Trump? Well, first of all, Hunter was near the top of the Democrats' target list before this; his suburban California district is exactly the sort they think they can flip. Now, he will presumably drop out (or will be inviting defeat if he stays in). So, the blue team's chances of flipping that seat just improved quite a bit, regardless of what Duncan does. And, of course, every step the Democrats take toward regaining control of the House is a step backward for the administration. When election results are pushed down to the fifth item on the page, you know it was either a wild day, or some very boring elections. Or, in this case, both. In any case, two more primaries were held on Tuesday, in Wyoming and Alaska. The big story of the day in Wyoming was the race for the GOP's gubernatorial nomination. There, the least Trumpy candidate—state treasurer Mark Gordon—got the nod, outpacing his nearest competitor (Foster Friess) by 7 points (33% to 26%). This is something of a poke in the President's eye, especially since he gave an 11th-hour endorsement to Friess on Tuesday morning. However, it's not that big a poke (and certainly nowhere near as bad as all the other setbacks Trump suffered on Tuesday). Gordon triumphed primarily because the fire-breathing, Trump-loving, "we want an outsider" vote was divided three ways. Under those circumstance, the 33% of Republicans who like normal, bland nominees were able to triumph over the 67% who felt otherwise. In the general election, Gordon will face State Rep. Mary Throne (D). Given that 16,000 Democrats cast votes on Tuesday night, as compared to 112,000 Republicans, there is no "get out the vote" operation on the planet that can save Throne. So, Gordon will be your next governor of Wyoming. Beyond that, upstart Senate candidate Dave Dodson ran a solid campaign in his race against Sen. John Barrasso (R), racking up some big endorsements, and using $1 million of his money to blanket the airwaves with ads. The race was unpolled, and so it seemed that Dodson just might actually make a contest of it. Not so much, as it turns out. Barrasso won with 65% of the vote to Dodson's 28.2%, which means that the Senator outpaced his main challenger by an only slightly smaller margin than his House colleague Rep. Liz Cheney (R), who got 68% of the vote to her opponent's 20%. The duo will defeat Gary Trauner (D) and Greg Hunter (D), respectively, in the general election. In the Alaska gubernatorial race, only the GOP slot was contested. Former Alaska state senator Mike Dunleavy triumphed there with 61% of the vote, compared to just 33% for his nearest challenger, Mead Treadwell. He will now face off against former U.S. Senator Mark Begich (D) and Gov. Bill Walker (I), who were both running unopposed. There is much pressure on Begich to drop out, so that most Democrats will vote Walker. If he doesn't do so, it will be a very interesting race. For Alaska's at-large House seat, Alyse Galvin easily secured the Democratic nomination, outpacing the Russian-born Dimitri Shein 56% to 23%. She is expected to turn the nomination down, and to run as an independent. We will see if that scheme works up against Rep. Don Young (R), who secured his party's nomination for the 24th time, crushing his nearest competitor by 55 points. Donald Trump loves campaigning—much more than he loves hanging around the White House. So he is planning to spend 40 days out campaigning for Republican candidates across the country this fall. Whether this is a good idea is something else. While it is true that he can whip crowds into a frenzy at rallies, it is also true that his presence also energizes Democrats against him. Which effect is bigger is hard to say, but his campaigning is certainly not an unmixed blessing for Republicans. To a large extent, where he campaigns is very important. If he just goes to states and districts where he is very popular, he will get large adoring crowds, something very important to him. But for the most part, it won't help his party much. The battle for the House will be fought in affluent suburban districts, where he is not popular at all, and a rally might draw a big counter-rally. The battle for the Senate will be fought in rural areas, but going to some small town of 1,000 people in, say, the middle of Montana, may not get a big crowd. These Donald Trump rallies are, at this point, pretty rote affairs. He tells a few falsehoods, brags about himself, slams a few opponents (or perceived opponents, like the NFL), and then pretty much calls it a day. So it was on Wednesday, when the only things that made the script distinguishable from any other rally appearance were his smears on Sen. Joe Manchin (D-WV), and his attempt to quickly turn the murder of Mollie Tibbetts—the Iowa student who was missing for a month, and whose body was found Tuesday—to his political advantage. It might seem odd—or reprehensible, perhaps—that the violent death of an innocent teenager would be co-opted by a president for his own gain. And for any other president, it would be unheard of. But Trump simply could not wait to crow that the man accused of the murder is an undocumented immigrant, and that this only happened because "the immigration laws are a disgrace". Because if one undocumented immigrant commits a violent crime, they must all be violent criminals, of course. Shades of Willie Horton. We will see how much more mileage Trump tries to get out of this particular story, though, because news broke late Tuesday night that the accused killer worked for the Lang family, one of the most prominent Republican families in the Hawkeye State. Probably the most newsworthy thing about the rally, though, was what Trump didn't say. Given all the setbacks he suffered on Tuesday (see above), and his propensity to vent whenever he's angry or fearful, reporters were waiting with interest to see what the President might say about Cohen and/or Manafort. Other than the usual Robert Mueller "witch hunt" complaints, however, there was nothing on that front, and neither man was mentioned by name. Was Trump unaware of the news, because he was traveling to West Virginia when it broke? Did he decide (or did someone convince him) that it was unwise for him to say anything? Is he waiting for Fox News to tell him what to think? Will he unleash on Twitter when he wakes up in the morning? These are all good questions. Trump did briefly speak to reporters about Manafort after the rally (see above), so he's definitely aware now of what happened. The National Republican Congressional Committee (NRCC), the group responsible for electing Republicans to the House, has come under fire from former top NRCC officials who are accusing it of making strategic blunders that could cost the GOP dearly in November. The (anonymous) officials told The Hill that it was a huge mistake to stay off the airwaves in August and leave them entirely to the Democrats. One of them said: "Republicans are in real danger of losing the majority, and it seems that the NRCC is asleep at the switch." The officials are worried that when the NRCC starts running ads in September, it will be too little, too late, as many voters will have already formed their impressions of the candidates and it will be too late to change them. Another complaint is that the NRCC is allocating funds for future ads in districts that the officials say are already lost. One name that came up is Rep. Barbara Comstock (R-VA), who most observers see as a dead woman walking. Nevertheless, the NRCC plans to spend big money in her expensive Northern Virginia district, despite her very likely defeat no matter how much it spends. In addition, there are dozens of open seats in territory favorable to the Democrats where money spent helping the Republican challenger is probably money being flushed down the toilet. However, other Republicans have said that the situation is not as dire as it seems because outside groups have been spending money in August, even if the NRCC has gone radio silent. For example, the Congressional Leadership Fund, which is aligned with Speaker Paul Ryan (R-WI), has spent money in Minnesota attacking AG candidate Rep. Keith Ellison (D). How that helps hold the House, though, is anyone's guess. While Sen. Elizabeth Warren (D-MA) has to win reelection in November before she can openly start running for president, that is a mere formality in blue, blue Massachusetts. Yesterday, she released a Senate bill that has zero chance of becoming law before 2021, but is likely to be a major part of her platform in her presidential run. Warren clearly understands that she will need Republican votes in 2020, so focusing entirely on things like a $15/hr minimum wage, Medicare for all, and other Democratic themes won't be enough. So, her platform will have a substantial focus on something that Republican voters are likely with agree to: Fighting corruption. Aug20 Giuliani: "Truth Isn't Truth"
Aug20 "Stephen Miller Is an Immigration Hypocrite"
Aug18 Why Hasn't Manafort Flipped? Aug17 Who's Who on the House Judiciary Committee? Aug16 Does Trump's Endorsement Matter?